"more than 20 pounds of food is wasted each month... "
If 20 pounds is 40% then their idea of a month's total food is translates to 50 pounds of total food monthly for one person That's only 25+ ounces per day. Right. And we're allegedly an obese nation – on 25 ounces of daily intake. What laughable numbers they deploy in their scare tactics. I believe the article says "more than 20 pounds of food is wasted each month for EACH of 311 million Americans." Try again to "do the math." While I'm not a biologist, you ignore (or can't see) the real issue of caloric intake that the roughly 1.5 lbs of food per person per day adds. And yes, unless you're legally blind, the country DOES have an obesity problem. Well, most of that food is produced here in US. So if we make food, isn't that up to us to decide what to do with it (eat it, toss it, donate it, etc.)? I don't support food waste but don't see a point why the rest of the world would hate us for what we do with our own food that we grow and produce. It is not our obligation to feed Africa if they chose to fight with each other rather than work and grow food for themselves. Listen to Noam Chomsky and you will learn why. Matt you definitely have a problem with understanding that not all of Africa's food problem is due to them fighting, (as you want to conclude) plus their being too lazy (as you wish to imply) to grow their own food. Much of the problem is due to their lack of arable soiL and the proper growing conditions which would provide sustainable food production...alas those deficiencies are also the fundamental reasons for their wars. This is a silly question: WHY? WHY? WHY? WHY IS IT WASTED? These numbers seem high for the average person. If retail chains, mass grocery stores, restaurants etc are included in the total, I can see that # being legit. How do we translate less waste over here into more food where it's needed? If we consume less does that mean we will put others out of work? Isn't that a form of waste? The article raises a good point about buffets throwing out their food because of health codes. Does that mean resturants and grocery stores are more likely to throw out food than give away leftovers because they are afraid of breaking the law and getting sued by someone they are trying to help? If I donated to an organization like Red Cross or some other good intentioned organization, how can I be sure the food is going to needy civilians instead of being seized by some greedy warlord? The best thing I can think of is to donate to a trusted local food bank and waste less. And doing that is a good start. Our local Master Gardener group raises and donates fresh produce to the local food kitchen that feeds the homeless...everyone can do a small part. More restaurants could do the same ... if only they would. The BIBLE tells me that food will be plenty for those that believe in the LORD and have earned his LOVE. I will continue to be blessed with this overabundance and let those of you going to HELL worry about your shortages. What really irks me is to watch my family pray over every bit of food that is put before them and then throw at least a quarter of it in the trash (either at the end pf the meal or after the 2-3 days of denial in which the leftovers sit in the fridge). It's like saying, and may God forgive me for the wording: "Dear Lord, please bless this food that I'm going to throw in the garbage. Thanks, Amen." Humanity is a virus to this planet. A total infection. Not a virus, more like a rash. Self and species hate much? Don't buy into the negative way information is presented by others and especially the media. IF we are the problem, we are also the solution. 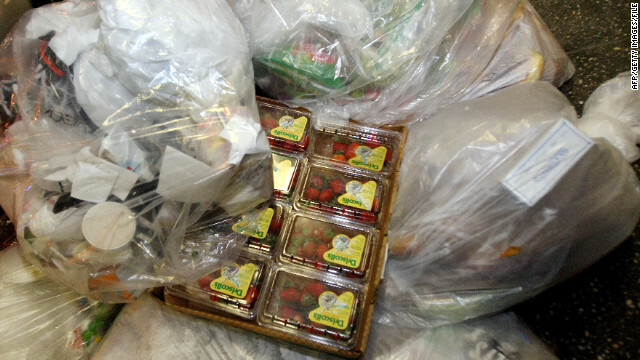 A great amount of food is wasted because people assume the “use by” date is a “drop-dead” line that one cannot cross. How is it that a bag of Fritos is ok at 11:59pm on the day before the expiration date stamped on the bag, yet 2 minutes later every single Frito in the bag is “poisonous” and must be discarded because it’s “expired”. That is shear lunacy. If it smells bad, it’s bad. Otherwise eat it and shut up. Stop being such a prima-donna elitist and worrying about expiration dates on food. You’ll know it if the food has spoiled. My dad was killed by a bag of expired Fritos. Ironically, it occurred at 12:01 am one minute past its expiration date. You want to know where food is wasted? School cafeterias. I've worked at the elementary levels, middle school and high school. Elementary kids MUST take a milk, fruit/veggie, main dish, etc. They will say, "but I don't like milk", or "I don't like apples".... and as a food service worker we respond, "thats okay sweetie, you still have to take it but you don't have to eat or drink it"...... I have seen hundreds of unopened milk or unopened Smuckers PBJ sandwiches and hundreds of apples, bananas, oranges, etc... you name it, they throw it away. At the end of the lunch shift, we throw ALL leftovers away. We throw away fresh salads made that day. So, you want to see waste? Go visit the lunch rooms across America. Anyone dumpster diving behind a school at the end of the day would find a bounty of good useable food. Sounds like the bigger problem is with kids who for whatever reason don't want to eat fruit and vegtables and drink things that are better for them than pop. Sad. We need to change our mindset and behavior. After discarding some chicken and other food recently, I suddenly realized how often I do this simply because I don't want to cook or want to eat something else. The problem is the animal has already been slaughtered. Another American disgrace.......part of this is from living in a culture of litigation, e.g., the local grocery chain store will NOT reduce price on or give away even an apple with a spot on it for fear of being sued. I asked the manager when in human history someone has died from eating a bruised apple, and he said, tough, we're not doing it. What a disgusting inexcusable waste of resources. I have a solution. Start eating the lawyers. Were the fattest hogs on the planet now. Imagine if we ate it all. If your city served up Taco Bell & Rally's..you'd pitch this slop, too! Give me TV-Dinners or give me death!